Yesterday, I found out a fellow blogger passed away. Leslie Sisti was the brilliant writer behind A Blonde Ambition, one of my all time favorite blogs. Her writing has always captivated me, and I love reading her positive, witty posts. Leslie had a heart complication that worsened after the birth of her second daughter, and Monday morning, she went home to be with Jesus. She was 30 years old. She had a husband. 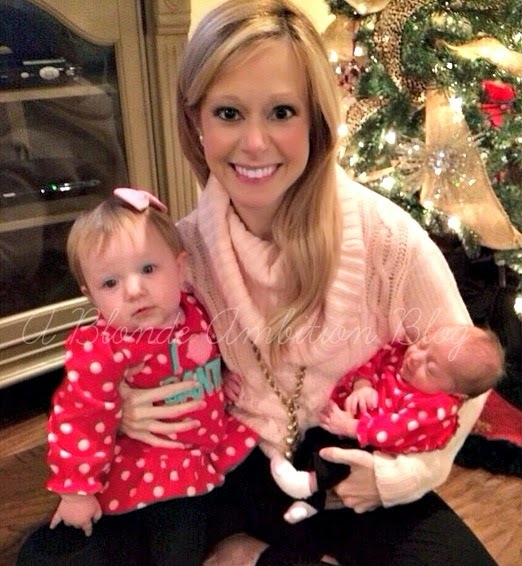 She had 2 gorgeous daughters under the age of 2 who will grow up without her. She had a beautiful life, and now it's gone. I've never met her, but I think when you read what someone plasters on their corner of the interwebs for long enough, you start to feel like you know them. When I read she had passed away, I couldn't help but cry for her husband and the babies who will grow up without a mother. And then, all I could think about is a stupid argument Parker and I had on Monday. It was so stupid, I don't even really remember what it was about. I was tired and stressed and lashed out at him for no good reason. I think we've all been there, but I wasted a night we had together. I wasted it being stubborn and grouchy instead of loving and intentional. Yall, life is too short for that. It's unrealistic for me to think I'm never going to get impatient with my husband again or a family member for no reason. It's inevitable, but I want to be more intentional, more appreciative, of the time I have with those who I love so much. We so often live life like it's going to go on forever, but everything can change so quickly. It's not worth little fights, little arguments, little grudges. It's not worth it at all. Today, hug your mom/dad/brother/sister/spouse/babies a little tighter. Practice patience, see the good, and let love in. Life's too short to live any other way. Amen! What beautiful words- life is so short and fleeting!! Oh no :( I hate to hear this. Thanks for the reminder to live lovingly & intentionally. I was also so incredibly sad when I heard this. :( I can't even imagine. i did not know her, or read her blog....but man that makes me so sad. i am completely amazed at how many people have donated, and blown it out of the water. what a great post today, a great reminder to cherish what we have and not let the little things get in the way. It really puts life into perspective when stuff like this happens. Such a beautiful post. Beautiful words. My heart just aches for her husband and daughters. This is just heartbreaking, Life really is so short. My heart breaks for this family. She's beautiful. Thoughts and prayers to her family and friends.